A new born baby brings lots of happiness and uncountable joy’s with his arrival on this earth. Really, it’s a great moment for the parents and the baby’s all near and dear relatives. On this happy moment the parents surely deserve congratulations and the baby as well good wishes. If you’re fall in shortage of wordings to congratulates and looking for what to say for New Born Baby Wishes then you may find this post more helpful to get some amazing new born baby wishes and messages which are appropriate for both new born baby boy or girl. Just take a look and surely these messages and wishes for new born baby will make your task easy, also you may use this as new born baby card messages. For all the joy and smiles they bring, a new baby is worth everything. Congratulations on your new arrival! Can’t wait to see that sweet little smile. May your precious new born baby brings a happiness to the world and special joy to you! So happy for you two! That’s going to be one lucky baby. A father so handsome, a mom so pretty – no wonder your newborn is such a sweetie. Ahhh! Freaking out over here. Congratulations, you guys! There is nothing sweeter in this world than the smell of your new born baby’s breath, the happy cooing sounds and the smell of baby skin. Congratulations on your new bundle of joy. Welcome to the new born and congratulations to Mom and Dad! Wishing you all a lifetime of love, health, laughter and happiness together. Congratulations and a very warm welcome to your new born. May his/her life be blessed with good health, love and laughter. A little one has joined you both, how happy you must be… It was great when there were two of you, but even better now there’s three! Congratulations! Now is the time to enjoy your baby’s little feet and baby smell. It will not be there forever, and you should take as many pictures as possible. You will want to miss a single precious moment! If life could be measured in cute drools and adorable giggles, yours is just perfect right now. Congratulations. Congratulations on the arrival of your new baby! This new addition will bring you lots of cuddling, fun times and baby2sweet memories. It will be worth the sleepless nights. All the best to your family. May your baby’s cute smile and laughs, be a spike of happiness in your life’s graph. So happy for you two! That’s going to be one lucky baby. Congratulations. Babies are wonders, babies are fun, congratulations on your new little one! Love just got real. So very excited for you. A new born baby will make love stronger, days shorter, nights longer, bankroll smaller, home happier, clothes shabbier, the past forgotten, and the future worth living for. I just got news of an angel going to make its presence felt in your life! Get ready for laughter, big noise and lots of hugs! Welcome to the world, little one! So thrilled that you’re here! Not all treasure is silver and gold… Congratulations on your ‘personal new treasure’ and little darling! What a very lucky baby! Best wishes on your dearest new arrival. We hope you are all doing well. Enjoy every moment with your precious little one! Your new born baby has chosen you to be her/his mommy and daddy. I think she/he has made a very good choice. Congrats and all the best for your new family! Congratulations on the safe arrival of your newest family member!! May babyhood be filled with lots of joy and make for lots of wonderful memories. All the best! No one can imagine life having their own children. But when they are born no one can imagine life without them. Wishing your new born good health and happiness! Just to say “Hi” to the new member of the family! He (she) couldn’t have happened to a nicer parents! You two are going to make such amazing parents. So many dreams, so many wishes. So many hopes, so many questions. Such happy feelings, such a small human being. Welcome to life, little prince. May your baby boy be the angel that you were always looking for. May he make your life happy, prosperous and pure. You two deserve every bit of happiness this baby is going to bring you. Congratulations. I don’t know who is more blessed. Either you are for having a new little baby boy, or your baby is for having you as parents. Congratulations to everyone! Congrats on the first arrival of your new baby boy! May your son fills your life with joy and love! We can’t wait to see the many ways God blesses you with this little one. A baby boy makes a mother out of his mom and a father out of his dad. So many happy and wonder-filled times ahead for you…congratulations. God has blessed you with a life to look after. We will pray for you to have the wisdom, patience, and endurance to carry through with your job. Congrats for baby boy! We’re really excited that your new baby boy has arrived safe and sound! May your new role as proud parents be filled with much joy and happiness 🙂 Lots of love. Your life will now be full of cheers, because from two you will now become the three musketeers. 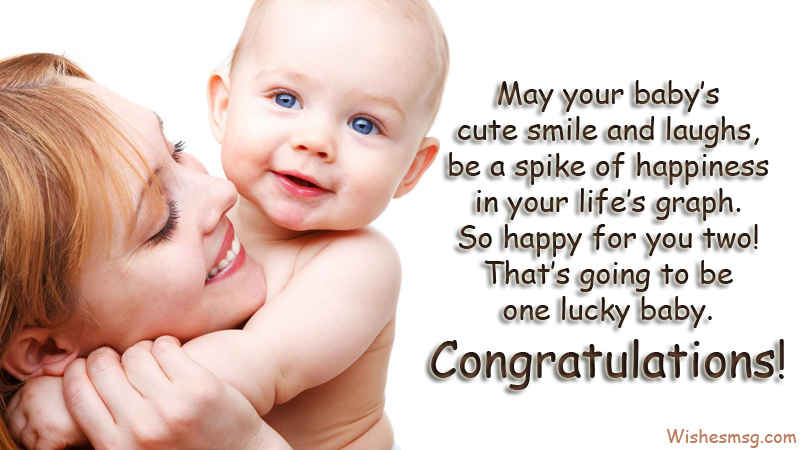 Congratulations for becoming parents to a baby boy. There’s something about babies that make us smile and believe in goodwill to all humans. We feel warm and fuzzy all over and start wishing good wishes for everyone. We look forward to meeting your new baby boy soon. May your little newborn girl play with fairies, grow angel wings, braid the hair of a mermaid, fly to the moon and ride a unicorn. Congratulations on your new baby girl! This is such a wonderful time for your family and we hope that babyhood is filled with lots of fun, love and cuddles. All the very best! Dear, your pair has always been perfect but with the birth of your newborn baby girl, your family has now become picture perfect. Congratulations. Experiencing the birth of a baby girl and watching him grow is one of life’s greatest treasures. Take it slow; before you know it, your little baby girl will not be so little anymore. My warm wishes to your little baby girl. Get ready for lots of laughter and noise, big hugs and so many joys. Congratulations and all the best! As you welcome your new baby girl, it is my wish and hope that all of the troubles of the world will disappear every time he smiles at you. May this little baby be the sun to your shine, sweet to your heart, cup to your cake, ice to your cream, sun to your rise, heart to your beat and everything else you can possibly imagine! I congratulate you for going past morning sickness and pregnancy food cravings. Wishing you good luck for nappy changes and midnight feedings. I heard the great news: Welcome to the club, newbie parents! It’s going to be one heck of a ride, and you’ll love every minute of it. Well, maybe not every minute but close. The birth of your newborn will usher you into a new phase of your life. Now you are no longer just man and wife. Maturity and wisdom will envelop your behavior and personalities forever. Now you have become a loving mother and a responsible father. Congratulations. This is it. The anticipation is over; you now know what your DNA soup can unleash unto this world. Prepare for the merry cycle of feeding, cleaning and rocking this sweet infant to sleep. Congratulations! Nothing brings home so much love, as a brand new baby sent from above. Congratulations on your new bundle of blessing. Can’t wait to see that sweet little smile. Congratulations to proud new parents! May these tiny feet will tiptoe with love into your hearts and stay there forever! Love just got real. So very excited for you. This is a beautiful time in your life that you will never forget. The birth of your child is something that changes you indefinitely. Welcome to the new bright spot of so many lives! We hope that you have find this post on new born baby wishes as helpful and they could help you to congratulate both the parents and new born baby boy/girl.